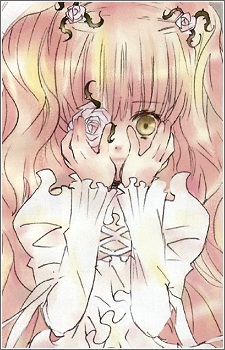 Kirakishou is the true seventh doll of the Rozen Maiden. Her costume is different from that of her imitation, Barasuishou, and she has a living rose in her right eye, whereas Barasuishou merely had an eyepatch covering her left eye. Kirakishou's precise abilities are the same as in the manga. In the manga, she is seen controlling rose vines when taking Hina-Ichigo's body and also when ensnaring Shinku and Suigintou during their first meetings. It could be possible for her abilities to consist of ice crystals in the anime, serving as Enju's inspiration when creating Barasuishou. Kirakishou, is shown very briefly towards the end of the final episode of Rozen Maiden träumend, watching Laplace no Ma dance with two Rosae Mysticae in his hands. Nothing more about Kirakishou has been revealed in the anime. She is said to be an astral door with no real body and therefore desires one. Eventually, it could be seen at the start of Rozen Maiden (2013) where she hijacked Hina-Ichigo's body. Unlike her other sisters, she can drain energy from a medium without a contract, as seen when she did with Jun. The body she took when she appeared in front of Jun, Shinku and Suigintou is actually Souseiseki's which she was forced out from when Jun made a contract with Souseiseki's ring. Her own rose vines consumed her when Jun rejected her and she then disappeared. Later on, she took the body of an antique doll in Jun's house that holds close resemblance to her astral body, with the exception of her eye and face shape.